The needy middle child of the speaker world. We’ve been covering a lot of wireless gadgets lately, and there’s a good reason for that. Wireless is the way of the future. Wires get tangled or fray, you’re forever ‘borrowing’ Aux cables from friends or fishing them out of your backseat, and God forbid you have to be more than two feet away from your phone. In that spirit: meet the Solis SO-7000. In this review, we break down the SO-7000’s sound, design, packaging and accessories, specs and more. To see how it stacks up, see our list of the best wireless and Bluetooth speakers. Thankfully, bass is one area where the Solis SO-7000 does not disappoint. They made damn sure of this when they installed the 5.25” subwoofer. One of our major complaints with wireless speakers recently has been that they can’t drive the low frequencies - something we experienced with the Google Home. It’s so unsatisfying, and we’ve seriously been craving some bass here. We’re not big bassheads - we don’t want to disturb the neighbors. We just want these speakers to walk it like they talk it. The SO-7000s bass is low and defined, and doesn’t sound overly punchy, or rumble to the point of spoiling the rest of the sound. It’s a balance we want to see in our wireless speakers. The highs come through, loud and clear. Vocals in the mid to high-mid range sound great, and instruments are easy to pick out from the mix. This is great for fans of pop or electronic music that include a lot of detailed effects. The speaker doesn’t add any special coloring to the music, maybe a pinch of warmth, but the playback sounds accurate and detailed. The only issue we had was low-mid reproduction. This is where the speaker tended to struggle a bit - especially with separating the low-mids from the rest of the surrounding frequencies. Tracks featuring acoustic guitars, bass, vocals, and effects in that range sounded a bit muddy and uncomfortable. We could tell the SO-7000 was trying, but it just couldn’t get the separation we wanted, like we would have from something like the RIVA Festival. Now, that’s a sweet speaker! You can read our full, in-depth review here, and pick one up for a cool $499. The SO-7000 is perfect for anyone looking to fill a room with music, whether it be for a party or event, or even just easy listening at home. The 360 degree sound allows you to place the speaker anywhere in the room without having to worry about finding that ‘sweet spot.’ It can also reach a pretty decent volume level for its size without suffering any distortion. You’re probably not going to power your whole block party with it, but it could certainly pump up the jams for a medium to large sized space. If you can avoid the connectivity issues that we faced in our testing space - we’ll talk more about this in a moment - then this could be a great addition to your home. Especially with the multi-room connection options. For the price, the sound quality is solid, especially considering some smaller and lower-quality speakers cost more. But we’d like to see Solis fix their low-mid playback in the future. If they could nail this, they would have a fantastic little speaker on their hands. Hooray! Another black box. Seriously, manufacturers. Will you ever tire of building black boxes? Can they possibly get any bigger and blacker? Of course, the SO-7000 isn’t just any big, black box. No, the SO-7000 is a big, black cube. Joking aside, the design is pretty sleek. Though we’ve seen the cube bit done before in the Naim Mu-So QB, which we recently featured in our best wireless and Bluetooth speakers roundup, Solis did a bang-up job in designing this speaker. The plastic housing feels solid, and looks great. It’s more of a medium-sized speaker, and is pretty light at 10.5lbs. Although it is one of the aforementioned black boxes, its shape makes it easy to slot into a bookshelf, or even use as a centerpiece on your table. The SO-7000 features 360 degree sound, making it a fairly versatile device. You don’t have to worry about placement to get that ‘sweet spot.’ The drivers, which consist of four 2” full-range drivers, and one 5.25” subwoofer, are located in the center of the unit. The mesh grille wraps around the entire midsection of the speaker, extending to the top, protecting the drivers from any dust or debris. This may look nice, and be useful in theory, but also makes it somewhat difficult to pick up and move the speaker around. Keep this in mind if you’re planning on relocating it. It’s not exactly a tank, like the Bryston BryFi (full review here) - a speaker that weighs over 16 lbs, and looks like it could be used in a boulder rolling competition. Though it could be considered a portable speaker, due to size and weight, we would suggest finding it a nice living space within your home, and not forcing it to do too much travel. Despite its robust, plastic casing, the midsection does feel a bit fragile, and you wouldn’t want to risk damaging the innards. If you’re interested in a more portable Solis speaker, check out their 3lb SO-3000. Now, let’s talk about why we call the Solis SO-7000 the needy middle child. If you have kids, then you’ll understand what it’s like to not be able to leave the room without someone tugging at your leg, or crying from abandonment. How dare you try to use the washroom without me! How dare you! Well, welcome to the SO-7000 experience. First of all, we want to point out that not everyone is going to have the issue we're about to describe. 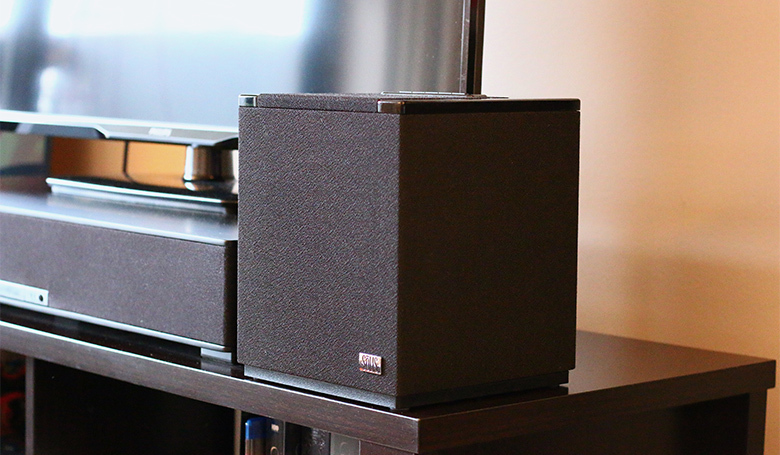 We tested the speaker in a typical, downtown apartment. Meaning: thick cement walls, God-knows-what construction, and every obstacle in between. And the SO-7000 failed. Miserably. In an area where not even a $55 SkullCandy Barricade had issues. We had such a hard time staying connected to this speaker that it was actually a struggle to use in day-to-day life. We tried, we really did. We wanted to love this speaker, but the constant signal drop was just a little too much of an inconvenience to get this thing within any distance of an Editor’s Choice Award. When tested in other environments, we didn’t experience the same issues, but we can’t guarantee that you won’t meet the needy child. Fortunately, if you don’t mind leaving the baby with your phone, you can always connect using the standard Aux cable. Which is ever-so-nicely provided by Solis. The controls for the SO-7000 are located on the top of the unit. The buttons themselves are singular and depressible, which makes them easier to use than some of the touch control options out there…in theory. They’d be a lot easier to use if you knew what was going on. There’s the standard power, pause/play, bluetooth, and volume up/down buttons on the unit. That’s it, really. Seems simple, yes? But turning the speaker on and connecting it to your phone can be quite an ordeal. The SO-7000 makes typical connection sounds to let you know that Bluetooth is enabled, but the Mode light (located on the far right of the controls) and the power light (located on the far left of the controls) light up and disappear as they please. There’s little to no consistency here - at least in the model we tested - which can get pretty confusing. The rest of the controls for the SO-7000, like the ones utilizing the built-in Chromecast, can be found by using the Google Home app. This is where you’ll find all the options and access to streaming services, connections to other Chromecast devices for multi-room listening, and the ability to assign your SO-7000 as a slave to your Google Home. Once you’ve connected the two, you can use voice commands through the Google Home to play music on the SO-7000. This is an awesome feature for someone who wants the ease of voice commands, but doesn’t want to sacrifice too much sound quality. You can read more about the Google Home and its sound in our full, in-depth review. We admit that it was fairly amusing pulling this thing out of the package. Despite being a little less exciting than unboxing a lot of other gear we’ve reviewed - because it just comes in a box with nothing else - the initial reaction to the SO-7000 was promising. We could tell just by looking at it that we would have fun with this thing. The packaging is a standard cardboard box with Solis’s psychedelic pattern on the front. It looks like it belongs in a DJ booth, surrounded by fake palm trees and platinum records, maybe playing the Fresh Prince of Bel-Air theme song. It has all the branding information, instructions, and diagrams right on the box. There’s almost no need for a manual. The SO-7000 comes with its own two-piece power adapter, and an Aux cable. That’s it. No accessories, no fancy case, no extras. Just a speaker and some cables. Solis did throw in some packing peanuts to protect the box during transport, though. So thanks, Good Guy Solis. The SO-7000 has solid bass response, giving life to our music. The speaker reaches a decent volume level. ​It features multi-room connectivity, and the ability to connect to smart speakers using Chromecast. We experienced difficulties with initial setup, which lost the SO-7000 some points. The SO-7000 had outrageous connectivity issues in our testing space. Naim Mu-So QB $800 300 Watts Bluetooth/Wi-Fi Yes 2 x 1", 2 x 2.5", 1 x Woof. Solis SO-6000 $270 36 Watts Bluetooth/Wi-Fi Yes 2 x 3"
The SONOS PLAY:3 recently topped our best wireless and Bluetooth speakers roundup, and for good reason. It sounds fabulous, looks slick, and is super easy to use. Unlike the Solis SO-7000, the SONOS PLAY:3 also has great connectivity. This thing is a beast. And, at $249 - just one dollar less than the Solis - it’s a great deal. Because of the SONOS closed ecosystem, you can only use the multi-room function with other SONOS devices. But, fear not, for there’s a multitude of other PLAYs in the mix. Just choose from any of their other models, numbered one through five. The PLAY:3 is our obvious top alternative, and we won’t hesitate to recommend it. The RIVA Festival is a wireless powerhouse, and our obvious first choice in comparison to the SO-7000. Within the Festival sits 200 watts of power, with three woofers, three tweeters, and four passive radiators. Almost double the drivers we anticipated during the unboxing, and even more than found in the infamous Naim Mu-So QB. This thing gets loud, sounds fabulous, and weighs a ton. It’s currently one of our favorite wireless speakers, but it’s also out of some people’s budgets. Sitting at $499, twice the price of Solis’ speaker, it’s worth every penny. No connectivity issues, balanced sound, power like you wouldn’t believe, and a solid build that makes it seem like it could withstand a heavy blow - please don’t test that bit. If you can scratch up the extra dollars, go for this one. Speaking of budget-blowing gear: another cube design, as we mentioned before, is the Naim Mu-So QB. It’s the SO-7000’s more attractive cousin. And, at 300 watts of pure power and price - $800 to the Solis’ $250 - it makes an intimidating prospect. We don’t want to be so bold as to say it’s good value, but for Naim quality under $1K, we can’t complain. The Mu-So QB also dominates Solis’ tech, with five drivers and a passive radiator. The sound is excellent - though maybe not as great as some of the pricier Naim models - and usability is beyond better. Naim’s app is, simply, awesome, and is fairly easy to set up. It’s an excellent alternative for someone looking for a cube design with great sound. You can also swap out the grilles on the front for different colors - Solis, take note. Because we must compare the SO-7000 to one other Solis product - for fair comparison, at least - here we have the SO-6000... Really, Solis? What makes this naming technique worse is the fact that, while the SO-3000, 6000, and 7000 are wireless speakers, the SO-7500, and 8000 are not. They are hi-fi systems. Why, you may ask? We have absolutely no bloody idea. If not for the absolutely god-awful naming technique, this speaker’s redeeming quality is the fact that it looks really cool. Like, put this in the center of your house and name it Gerrard, cool. It might be a little outdated in comparison to the SO-7000, but we weren’t too attached to our big, black box anyhow. The SO-6000 is a smaller desktop speaker, with only 36 watts of power, but it’s at least neat to look at. And, it only costs $275 to the SO-7000’s $250 - the price you pay for fashion.